Of all the cities found in H.P. Lovecraft’s vision of Massachusetts, perhaps none is quite so deadly as the small fishing village of Innsmouth. Decrepit and dying, Innsmouth is being consumed from within by an ancient pact once made to save the town. The investigators will find every hand turned against them as they explore its rotting docks and fetid beaches. In the end, perhaps the only way to save Innsmouth is by destroying it along with the terrible creatures that haunt its waters near Devil Reef. Innsmouth Horror requires a copy of Arkham Horror to play. Arkham Horror is a cooperative game for 1–8 players, ages 13 and up, that can be played in 2–4 hours. The Innsmouth Horror is the sixth Arkham Expansion, the third “big box” expansion (and the last one to incorporate a new board into the game). It’s also possibly my favorite (Dunwich Horror runs a close second, but I find DH doesn’t become an “active” area in a lot of games)). Thematically, this expansion is extremely well down, depicting the title settlement from Lovecraft’s Shadow Over Innsmouth and its degenerate residents. It also introduces some very cool game elements to Arkham Horror. Ancient Ones: Innsmouth adds 8 new Ancients to the game, I believe the most of any single Arkham expansion, including a few personal favorites like Ghatanothoa, Chaugn Faugn and Cthugha, as well as Quachil Uttuas (considered by many to be the most difficult Ancient One in the game). Innsmouth Look Cards: Very much in keeping with the theme of Shadow Over Innsmouth, and Innsmouth itself, these cards represent the possibility that, like the protagonist of Lovecraft’s tale, the investigators may carry the taint of Innsmouth blood in their veins. Over the course of the game, certain events may cause the investigators to draw one or more Innsmouth Look cards and possibly succumb to the call of their Deep One ancestors. Innsmouth Board: Innsmouth is an interesting place, with its residents and their ties to the Deep Ones (once the Doom Track reaches a certain level, the town goes under Marsh-all law, forcing investigators to sneak through the streets). It also has the looming threat of the Deep One Uprising (which can be countered by spending clues to load the FBI investigation track), and Devil Reef and Y’ha-nthlei which are difficult to access unstable locations (careless investigators can get stranded there for a few turns if no one comes to send a boat for them). Tread carefully in Innsmouth! Innsmouth Horror, Fantasy Flight Games’ third large-box expansion for Arkham Horror, is one of my favorite additions to the core game. It significantly ramps up the difficulty to an often difficult game, but there’s enough neat stuff in the expansion that makes it worthwhile even if you’re not looking for a bigger challenge. The town of Innsmouth — Innsmouth, the eerie fishing village featured in Lovecraft’s “The Shadow Over Innsmouth,” is included as a new location board for the game. As dangerous as Arkham is, the amount of open hostility the investigators can face Innsmouth is frightening. As the terror level increases, investigators will have to sneak through the streets to get to where they need to go. The writing for Innsmouth’s various locations is fantastic, and some of the creepiest in any of the expansions. It’s also a tough place, and one you can’t ignore — if you let monsters wander for too long, the Deep Ones Track will increase and bring the game to a quick (unfortunate) end. Having location encounters in Innsmouth can also lead to players drawing cards from the Innsmouth Look pile…and if you’ve read the story this expansion is based on, you’ll know that’s not a good thing. New Investigators — Innsmouth Horror comes with 16 new investigators, all of them thematically great. A good number of these characters are great overall, but even the so-so ones have some neat design ideas. Some of my favorites include: William Yorick, the grave digger, who can not only use monster trophies as clue tokens, but also permanently remove monsters from the game; Minh Thi Phan, the secretary, who is a fantastic support investigator for the entire team; and the underrated Finn Edwards, the bootlegger, who can sneak around town during the Mythos phase. I’m impressed at how tightly the mechanics for these investigators are tied to their themes. New Ancient Ones — The eight new Ancient Ones are fantastic: creepy, tough, and very unique. Quachil Uttaus stalks investigators and turns them to dust if it catches them. Cthugha essentially cripples investigators ability to move quickly, and Rhan-Tegoth makes killing cultists an incredibly bad idea. Personal Story Cards — My absolute favorite part of this expansion is the personal story cards. There are cards for every investigator in the game, and provide a way to flesh out the character’s backstory as well as add new challenges. In addition to some great flavor text, the cards come with pass and fail conditions for each investigator. The passing result rewards the player (usually by increasing the power of a character’s special ability), while the failing result punishes the character (sometimes something like permanent stamina or sanity loss, or reducing the usefulness of a special ability). Some of the pass and fail results aren’t as balanced as they could be, but overall, the personal story cards are fantastic. New Herald — Two new heralds are included in Innsmouth: Father Dagon and Mother Hydra. They work thematically with the Innsmouth board…and ONLY the Innsmouth board. I think it’s a neat effect how the two heralds can be used together to make things more challenging (or miserable) for the investigators, but some of the herald powers are so situational that it might be better using another herald instead. Dagon and Hydra would work well for a specific game — Innsmouth board, with Cthulhu as the Ancient One — but otherwise, they’re only OK. The Innsmouth Horror expansion is my favorite big-box expansion for Arkham Horror, and adds a lot to the game. The writing is great, the theme is effective, and the new components are fantastic. I think Dunwich Horror might be a slightly more useful big expansion overall, but Innsmouth Horror is a close second. Give it a whirl, and watch out for people with the last name of Gilman. Innsmouth Horror is a great example of when expansions are necessary for even a big box game and how they can take a so-so game and make it a great game. Arkham Horror has enjoyed a lot of popularity and play time over the years and with that probably about as much scrutiny as any game can get. Arham Horror is what it is; themey, social fun at the mercy of randomness. Small expansions add a theme twist or some new cards to refresh things a little. Combining Innsmouth Horror to AH for me, is where the game truly begins. Innsmouth horror doesn’t necessarily transform AH into a strategic masterpiece. Nor does it elevate AH into an auspicious realm of Boardgaming masterpiece of design that many hardened reviewers insist the game should have for the elevated ratings that the system enjoys. What Innsmouth Horror does do is enhance the theme and suspense of the game so well that Arkham Horror becomes more of a horror story event and experience its as tangible as a good movie. The new investigators are very interesting. The new old ones flavor well in with new obstacles and challenges. The extended map does a good job of stretching the daunting task of saving the world. The heralds and Innsmouth track add a new degree hopelessness to feeling that humans are so small and insignificant to workings of the old ones. You are given more choices that have new consequences, forcing players to manage new depths of cooperative play that are less subject to “quarterbacking” integrated together well with the base game to complete the Lovecraftian horror elements. Of all the expansions to the Arkham Horror system, Innsmouth Horror should be treated less as an expansion and more as the 2nd half of the base game. 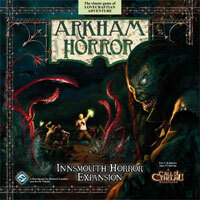 Innsmouth Horror (IH) is the second big box expansion for Arkham Horror. This expansion is centered on the small town of Innsmouth and the mysterious happenings of the Deep Ones. The sinister Deep Ones and even the Innsmouth townsfolk work behind the scenes to undermine the efforts of the investigators and help facilitate the arrival of the Great Old One (GOO). The investigators must discover the truth about Innsmouth and put a stop to the Deep Ones meddling if they are to have a chance at defeating the GOO. The quality of the expansion components is on par with the base game and very good. There is a mounted board, thick cardboard playing pieces, cardstock character sheets and fairly durable cards. The artwork on the board, character sheets and cards is very good and further enriches the theme. The rulebook is 11 pages and includes examples of play and makes a few rules clarifications. No complaints about the components. IH is a big box expansion for Arkham Horror so it contains a lot of goodies. As mentioned above, there is a small game board which depicts the Town of Innsmouth and its many locations for investigators to explore. This expansion includes several new investigators, GOOs, and additional Mythos, Gate, Common item, Unique item and Spell cards to beef up their respective decks. There are also more monsters, some new and more base game monsters and two Heralds. Set-up for Arkham Horror is one or two minutes longer with the inclusion of the IH expansion. The new board is placed adjacent to the base game board. The new Mythos, Gate, Spell and item cards are shuffled into their respective base game deck. The new Innsmouth Look, Personal Stories and IH location decks are shuffled and placed near the game boards. The Deep Ones Track tokens are also placed near the game boards and additional monsters are tossed into the monster cup. The game board is huge and there’s a lot of stuff placed around it so make sure you have a big table! I’m going to skip my usual detailed write-up on the game mechanics in favor of focusing on the new mechanics this expansion has to offer. The IH expansion introduces several new mechanics, some of which significantly change the game. Notable new mechanics include Deep Ones Rising Track, Personal Stories, Aquatic Monster Movement, The Innsmouth Look and Martial Law. Most of the new mechanics make the game slightly more challenging. The Deep Ones Rising Track is perhaps the only new mechanic in IH which significantly impacts game play. This track represents the behind the scenes scheming of the Deep Ones in Innsmouth. A token is placed on this track any time a gate is prevented from opening or a monster moves into a vortex. If the Track fills up, then the GOO immediately wakes up and the Final Battle begins. The investigators can gather evidence and convince the Feds to help. During the Upkeep Phase, an investigator in Innsmouth may spend 1 or 2 Clue tokens to place them on the Feds Raid Track corresponding to the color of the location the investigator is currently in. If the Feds Raid Track is filled, then the Feds wipe all current tokens off the Deep Ones Rising Track. During set-up, each investigator receives his/her Personal Story. A Personal Story gives the investigator a personal goal to achieve during the game. Once achieved, the investigator receives a bonus which could be an item, better stats, a new ability or something else useful. The IH expansion introduces Aquatic monsters to the ever growing monster cup. Several locations in Innsmouth (and Kingsport) are marked as aquatic locations. The expansion includes two tokens to mark The River Docks and The Unvisited Isle on the base game board as aquatic locations. A monster with the aquatic movement ability in an aquatic location will move to another aquatic location if an investigator is present during the monster movement part of the Mythos Phase. Some people, unbeknownst to them, are descended from the horrible Deep Ones. Some events may trigger these dormant genes to spring forth to life, transforming the person into a Deep One! An encounter may instruct the player to draw one or more Innsmouth Look cards. The cards are resolved one at a time. If one of the cards indicates the investigator has the Innsmouth Look, then the player follows the instructions. Usually the investigator is removed from the game. Otherwise, nothing happens and the cards are shuffled back into the deck. Up until now, direct minions of the GOO have wreaked havoc on Arkham. However, Innsmouth is different. Ordinary townsfolk are responsible for sinister deeds, giving the GOO control of Innsmouth! Innsmouth is a dangerous place for the investigators to snoop around. When the Doom Track on the GOO reaches the halfway point, Martial Law is declared. Hereafter when an investigator ends his movement in an Innsmouth street or location area he must make an Evade check to avoid being arrested and thrown in jail. Each street or location area applies a modifier, shown on the board, to the Evade check. The Innsmouth Horror expansion is well liked among Arkham Horror players and is my favorite expansion. This expansion packs a lot in the box and adds some new mechanics as well. I find that the new mechanics are subtle and for the most part well integrated into the game. That said the Deep Ones Rising Track, Martial Law and the Innsmouth Look cards can have a sudden significant impact to game play. I incorporate all these new mechanics whenever playing the IH expansion. I enjoy them and feel as though they don’t increase fiddliness and game time all that much. They are fun, it’s a blast to watch someone try to break out of the Innsmouth jail or awesome when someone completes their Personal Story! The new mechanics are good but the beauty of the IH expansion lies within the other components. This expansion has some of the best investigators to play and some of the most interesting GOOs to face. The designer also got very creative with the Mythos cards, and encounter decks. There’s always an unexpected surprise or twist waiting for you in the encounters! The new items and spells are handy and fun to use. The Innsmouth board is also very engaging, no quiet board here! Besides the Deep Ones Rising track and Martial Law, gates, monsters and clues will appear on this board. The Innsmouth board will not be ignored! The Innsmouth Horror big box expansion is a must for Arkham Horror fans! This expansion includes a new board, great new material and introduces some good new mechanics too. I highly recommend the Innsmouth Horror expansion. If you have read my other Arkham Horror reviews, you should know that I strongly believe that you are not getting the full Arkham Horror experience without at least one Big Box expansion, and there is no better way to get that experience than adding Innsmouth Horror to the base game. Innsmouth gives you the most for your money compared to Dunwich and Kingsport in that it contains 16 new investigators and 8 new ancient ones, double what the other expansions offer for the same $40. The board is also the most entertaining of all three of the expansion boards. It comes with an entirely new track called the “Deep Ones” track. Each time a portal is supposed to open, but is prevented because of an elder sign or an ability, the track advances by one. The track also advances when a monster wanders into one of the vortex spaces on the Innsmouth board. If the track fills with 7 deep ones tokens, the ancient one awakens. One way to prevent the track from filling is to spend clue tokens to fill up the same track, but starting from the opposite end. If 7 clue tokens are placed before 7 deep ones tokens are placed, the entire track is wiped clean. As for the spaces on the board, you move around like normal until the terror track reaches 3, and then Innsmouth enters a state of marshal law in which you constantly have to be making sneak checks to move around Innsmouth, or else you’ll be thrown into Innsmouth’s jail. Additionally, a new deck for the “Innsmouth Look” is added. Occasionally you will be instructed to draw from this 10 card deck. 9 of them do nothing and 1 of them kills your character and replaces your token with a monster. Generally, when me and my group play a game of Arkham Horror, we only add the Innsmouth board (even though the other 2 boards are available to us), so I would say this is a must have for anyone who enjoys Arkham Horror. To find out more about Arkham Horror, Dunwich Horror, or Kingsport Horror, check out my reviews on my home page. I’ll also be reviewing Miskatonic Horror soon! You know those times in Arkham, when nothing really bad happens in the Mythos phase? The times when you breathe a sigh of relief? Well, Innsmouth manages to turn those times into something dangerous. The Innsmouth locations are dangerous, and that’s not all. The expansion also includes new characters, items and cards for every deck. Just remember, Arkham may hate you sometimes, but Innsmouth hates you more. I am an unapologetic fanboy of all the Arkham Horror games. I’ve even gone so far as to have a custom case built for my collection. This expansion is my favorite, though. With a wealth of fun new characters, great old ones, and yet another way to lose, it’s truly one of the most fantastic horrors. I really love this expansion. The ‘innsmouth look’ and mechanic that punishes you for not having gates open is a challenging and engaging one, and adds to the tension of the game. It’s far superior to Kingsport, which was mediocre at best. No game of AH is complete without IH. The personal quests alone are a welcome roleplay-y addition. And yet, IH keeps giving and giving. BUT: Be prepared to loose alot. Add a Review for "Arkham Horror: Innsmouth Horror"